Books I have read or am reading. I don't write synopses, just my thoughts. On the advent of the twentieth anniversary of the Branford Boase award, Walker Books have brought out a new edition of Fire Bed & Bone by Henrietta Branford, for which she won the Guardian Children’s Fiction Prize. I was very excited to get my hands on a copy of this book and read it. I won the Branford Boase award in 2017, but all I knew about Henrietta Branford was that she was a talented writer who had tragically died early in her career. I had not read any of her books. Fire, Bed & Bone is unlike any historical children’s book I have read. Set in 1381, it tells the story of the Peasant’s Revolt through the eyes of a loyal dog, whose master Rufus is a peasant supporting the revolt. Compelling reading, this book powerfully evokes a brutal time, staging the conflict between the peasants and the landowners in a vivid and easily imagined way. I was gripped as soon as I opened the book and I didn’t stop reading until the last page. The story is gritty and horribly exciting with truly shocking moments. The dogs are invested with a truth and mysticism which highlights the crass nature of the humans. I can see why Henrietta Branford was heralded as a fresh, exciting and important voice when this book was first published, and despite the passing of twenty years, she remains so. I heartily recommend this book to teachers engaging with the topic of the peasants revolt or the middle ages. It is a short, dramatic read that children will be immediately invested in, but be aware that the subject is violent and there are scenes that will upset some, so do read ahead. Anyone out there who loves a good read, enjoys historical fiction, or wants an advanced class is narrative voice should read this book. When I closed the book I was overcome with the feeling that if Henrietta Branford had had more time to spin stories, the world of children’s fiction would have been richer for it. Just before Christmas I was lucky enough to be at a Waterstones event featuring a gaggle of writers, one of which was Christopher Skaife, the Ravenmaster at the Tower of London. I bought several of his books and got them signed, as I thought they’d make good Christmas presents. They did. On the way home I opened my copy of the book, to see what I might find inside. I didn’t put it down until I got to the end. What a book! Once I had read it, I left if alone for a week and then read it again. I have read aloud more than a couple of passages to Sam, my husband, who has now read it and loved it, and the book has inspired a family visit to the Tower to see the ravens. The Ravenmaster is a very special book. If you are interested in either birds, history, literature, the military, life in a castle, folklore, mythology, unusual careers, interesting people, then this book will delight you. Even if you are not remotely interested in any of those things, this books is a biographical, non-fiction work that is quick to read, well written, funny in places and sometimes utterly profound. The relationship between the Ravenmaster and the ravens in the tower is fascinating. The job is fascinating. Christopher Skaife is fascinating. The birds are fascinating. I cannot think of a single type of person who wouldn’t enjoy this book. Please, pick up a copy and read it. It is the very best kind of book. It gets my full five ***** and is appropriate for readers 12 and up. In Amber Lee Dodd’s new book, a girl called Amelia - with the spirit of an explorer - makes a powerful wish and begins a mythical quest. In Lighting Chase Me Home, Amelia tells us the story of her surprising, touching and magical adventure. This is the kind of book I loved to read when I was eleven. It reminded me of an Enid Blyton adventure. It’s set on a remote Scottish Island, which is a character in the story itself. The greatest female adventurers to have ever lived provide courage and inspiration to our hero Amelia who is struggling with the separation of her parents and the repercussions of making a wish on her eleventh birthday. Amber Lee Dodd has conjured up an emotional and thrilling tale, which is a delight to read, fast paced and hard to put down. Good for the adventurous girls and boys in your family. As I write this, Hilary Mckay’s book The Skylarks’ War is the Waterstones book of the month, and I’m not one bit surprised. I read this over Christmas and can thoroughly recommend it. It is a beautifully written story about young people growing up during World War One, but in particular about Rupert, Peter and Clarry Penrose. It starts off with hazy summers in Cornwall and the threat of boarding school. We follow the Penroses through their respective educations as they grow into young adults and war is declared. The book deftly describes social structures, political views and prejudices without them weighing down the narrative. The characters are fully rounded, multifaceted creatures with social restrictions and struggles and passions each their own. The reader is emotionally invested in each and every one of them which is no small feat. This book is a complex, engrossing, moving and joyous read, that will be enjoyed by readers of all ages. Hilary Mckay is a master of her art, her prose is a delight, and The Skylarks’ War feels like a classic from the very first chapter. This book has been shortlisted for the Costa award and I would be delighted if it won. There’s something for everyone in this book. Do yourself a favour and grab a copy. It’s pretty special. 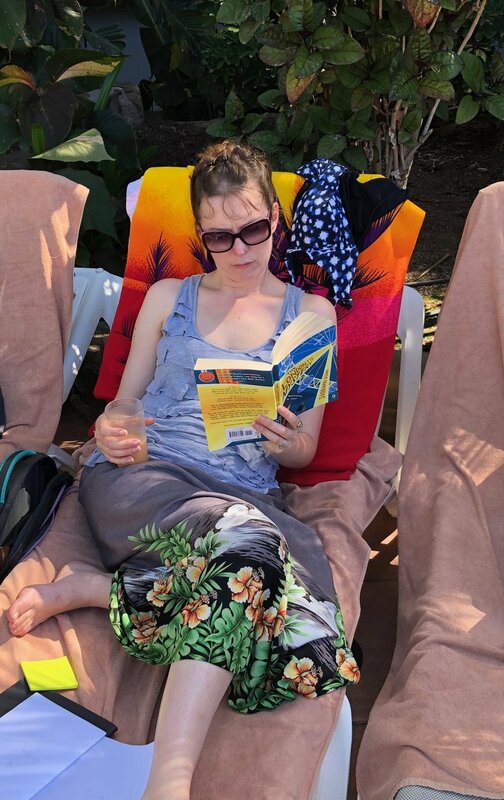 Me, on a sun lounger in Gran Caneria. Yes I am sat in the shade drinking tea. Can’t help being English now can I? The London Eye Mystery by Siobhan Dowd has been recommended to me by so many people, but it was Robin Stevens who made be buy it, because she wrote a sequel called The Guggenheim Mystery which I am eager to read, but of course I can’t read it until I’ve read the original mystery. This book has been sat on my TBR (To Be Read) pile for over a year, so it went straight into my suitcase when I nipped off for a half-term holiday with the family. Everything I have been told about this book is true. I consumed it in a gulp. It is brilliantly written and a fabulous mystery. The central characters of brother and sister, Ted and Kat, are complicated, fascinating and relatable. The set out to solve the mysterious disappearance of their cousin Salim, who got on the London Eye, but never got off. Ted’s autism is handled deftly and sensitively, leading one to assume Siobhan Dowd must have done her research. What I enjoyed about the mystery is that the book is not about Ted’s autism, nor does it turn it into a mysterious superpower, however his way of thinking lends wonderful layers to the writing, as he shares his passion and knowledge of the weather. I can’t imagine anyone not enjoying this book. It’s refreshingly contemporary as well as challenging for those little grey cells, and the best thing is that Robin Stevens has written the sequel, so I get to read more. I did not read The Railway Children when I was a child. Nor did I see the film. All that I knew was that there was a scene in the movie where Jenny Agutter waved a red flag at a train to stop it, with some other children. My new writing project is all about trains, and so I immediately picked up this pretty pink hardback edition of the classic and set about reading it. I don't know what I thought it would be. If I'm honest, probably dull, fusty, written using antiquated language with some Famous Five type children and some trains. I was wrong. So wrong. This book is about family, and bravery and decency and of all things, socialism. Oh goodness, how I loved it. I loved the children, Bobbie, Phyllis and Peter. They squabble and are ghastly to each other, and love each other desperately a moment later, just as real children do. And the railway is the wonderful device around which the whole book hinges, and is described in delicious detail. Yes, some of the language is old-fashioned. E. Nesbit has a strange habit of breaking the fourth wall to skip bits she thinks aren't of interest, or that the characters wouldn't like us to know about, which both hurls the reader out of the story, yet makes us feel the characters to be all the more real. What I wasn't prepared for was how much I grew to care about this fictional family and how much I wept at the end. Of course, you have probably read this book and are nodding, but if like me you haven't, then you are in for a treat. Some books are just special. A Jigsaw of Fire and Stars by Yaba Badoe is one of those books. It is the story of fourteen year old Sante, who is part of Mama Rose's circus, has the skills of an acrobat and an uncanny affinity with animals. Sante was found by Mama Rose when she was a baby, washed ashore in a chest stuffed with treasures. A survivor from a refugee ship that had sunk. One day the circus arrives in a place where people recognise Sante, and her dreams of her dead family become cries from beyond their watery grave for revenge. When I was reading this book, I fell in love with Sante. She is a great protagonist. And in fact I loved all the females in this book and the relationships between them. This book has strong, interesting and complex characters a plenty and they're mostly women. The story is a powerful one, jam packed with the magic of the circus, the ghostly otherworld of the dead, and the horrors of people-trafficking. It is written artfully, rich with the imagery and magic of African folklore. You will not read another book like it. It is a page turner that had my heart beating a thousand different rhythms. At one point I could hear my heart galloping in my chest as I read, it is that dramatic. I enjoyed every page of A Jigsaw of Fire and Stars and I will be buying it for every teenage girl I know with a birthday, because it should be read widely. If you haven't come across this book yet, then please seek it out, because, as I said, it is special, and you will thank me. I can't wait to see what Yaba Badoe writes next. I'll be first in line at the till. The Lost Magician is the new book from the wonderful author of The Last Wild trilogy, Piers Torday. Simply by opening a book in a magical library, four children find themselves in a world called Folio where the characters from fairy tales are real and locked in battle with data spewing fact robots. The magician who created the library is missing and war has broken out in his absence. The children, Simon, Patricia, Larry and Evelyn, are themselves escaping their own experiences of London during the Blitz. These must surely be the most perfect ingredients for an epic adventure! In articles that I have read about the book, Piers has spoken about the relationship between his new story and C.S. Lewis's Narnia series. He was inspired by his love of the Narnia stories to create the world in The Lost Magician, Folio, where it is not Christianity that is the under attack but the imagination. His book is an homage, using the allegorical fantasy trope to reflect on our world today. A battle is taking place in the world of the library between the stories and the facts, all the while the real threat is the 'never reads'. For those who love the Narnia stories, like me, the echoes and clever parallels add a layer of joy and satisfaction to the reading experience. However, if you've never read C. S. Lewis, then it won't make the blind bit of difference to your enjoyment of the book. Me reading The Lost Magician in a field on the edge of a woods. Magic. This book is so much more than a reimagining of The Lion, The Witch, and The Wardrobe. The Lost Magician is a classic tale that explores the power of reading. You'll be on the edge of your seat as four war-weary children enter a magical library, and characters you know like the back of your hand come alive and don armour for the kind of battle you've never imagined before. An original, and imaginative war cry for the importance of reading and the magic of libraries. I hear that The Lost Magician is the beginning of a series, so I'm excited to read the next adventure in Folio. This story. Oh man, this story. You have to read this story. The 1000 Year Old Boy is unlike any middle grade book I've read before. I don't know how Ross Welford produced this. As an author, I read a lot of books and I think up a lot of stories, but this one, well this is something I could never have written. It is my favourite of Ross Welford's books by far, and I loved Time Travelling with a Hamster. I can't post my usual selfie with the book, as I was sent the manuscript and given 48 hours to read it, to quote for the cover, so I don't have a copy yet. To be honest, I'm a slow reader and I made my apologies in advance saying that I'd try, but I doubted I could read a whole book in that time. Well, I was wrong. I read it faster than that. This book is about a child who is older than any grown up, which means the book is equally as captivating for a child as a grown-up reader. I was enthralled by the story and constantly second guessing how Welford was going to resolve it and always getting it wrong. It's thrilling and fascinating and returns to one of Ross's favourite subjects, time. What would it be like to live forever? This book is historical and current, it's moving and exciting, it's thought-provoking yet funny. 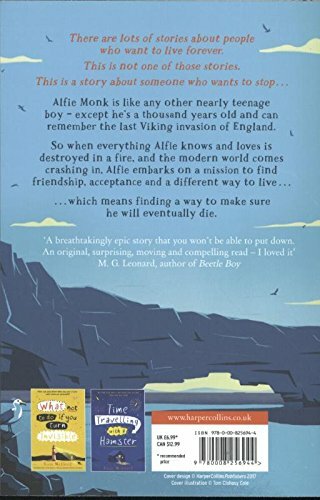 The children at the centre of the story are awesome characters, but none more so than the unusual Alfie Monk. I can't really tell you what this story is about without giving away some pretty important plot points and it spans a thousand years and countless cool locations! The research that must have gone into the telling of this story blows my mind. Seeing as I can't post a selfie of me with the book, I'm going to post this picture of me taking my hat off to Ross Welford, because this is an EPIC book. Do yourself a favour and have a read. I take my hat off to you Mr Welford. I read Sky Song by Abi Alphinstone over Christmas, which was the perfect time to enjoy a magical fantasy tale about Snow Queens, Sky Gods and brave children. There is so much to enjoy in this book, the snowy wilderness of Erkenwald, the three distinct tribes that live there, the wild creatures and the old magic. However the thing that makes this story really sing is the triumvirate of Eska, Flint and Blu at the centre of it. They are fantastic characters and the relationships between them are powerful and warm. Without a doubt my favourite character is Blu. I assume from the description of her that she has Down's syndrome. As I read, I realised that I don't think I have read a fantasy story with a character like her. She is adorable, funny, sensitive to truth and so beautifully described. It was new and wonderfully surprising to read about her, and the contribution she makes to the adventure is meaningful, she's no bit part. Abi Elphinstone nimbly makes the point that being different can be an advantage and it's the eye of the beholder which can be limited. I also loved Balapan, the eagle. I'm a sucker for a story that features a child who has a special relationship with an animal, and the relationship between Eska and Balapan is a pretty special one. I won't give much away but let's just say, I want one. I'm hoping there will be another Sky Song story because I want to read more about them and Eska's voice. Sky Song is a unique, compelling and magical adventure that I cannot recommend highly enough to middle grade readers. There are many great qualities this book posses, yes it is a brilliant, heart stopping, tear inducing, soul soaring adventure, but it more than that. It champions a positive relationship with nature - which I am all for - and makes a comment about the negative effects of separatism, in the tribe's responses to each other in the face of the Snow Queens divisive attacks. And, last but certainly not least, it puts Blu into a reader's imagination, which may help people to view difference with more understanding. I am not surprised that Waterstones has made Sky Song their book of the month for January. It's pretty special. My son is a football fanatic and a reluctant reader, so I begged for this book and I’m glad I did. Kick is the story of Budi a twelve-year-old boy who works stitching football boots in a sweatshop in Jakarta. His life is a complicated negotiation of dangerous neighbourhoods, his own personal health issues, a gruelling job and poverty. However, his supportive family, love of football and desire to play for Real Madrid one day, keeps him going. This story champions hope, dogged optimism, and friendship. Football is a beautiful game that I only know a small amount about, but it makes for a wonderful metaphor in this story, the importance of playing as a team, of practice, of integrity, and as one of the highest paid sports in the world it throws the living conditions of the characters into stark relief. My favourite character was Budi’s grandmother, who tells stories to guide him, but it’s hard to imagine there being a reader who doesn’t like Budi. Kick is a beautifully woven tale with a frankly adorable protagonist, with a burning passion for football, living in a tough world. I should mention there is quite a bit of violence and suffering in the story. My heart ached on many occasions. This book is a great read to promote empathy and understanding, but best of all it’s just a great book. Skilfully written, and perfectly paced Mitch Johnston has produced a fantastic debut. I couldn’t put it down and I’ll be passing it on to my twelve year old next. The Goldfish Boy is a mystery story about a toddler who vanishes from a neighbour's garden. Our detective, Matthew, is a boy who is trapped inside by his OCD. This is a beautifully written book. The prose is so well constructed you don't notice it as you devour page after page of this compelling story. It is about relationships and the human need to communicate. It's about the ways we deal, or don't deal, with life and loss, death and struggles. It's about family and friendship. There is so much more going on in this book than the plot and it is all handled delicately, never over-powering the story. The plot is gripping and the way our unusual detective goes about trying to solve the mystery fascinating. I've seen comparisons between this book and Mark Hadden's The Curious Incident of the Dog in the Night-time, and I can see why, although they are very different. This is a brilliant debut. I have The Light Jar, Lisa Thompson's second book, on my bedside table, which I can't wait to read. I suspect that book will be a tear-jerker because The Goldfish Boy is about tough things and my eyes weren't dry when I came to the end of the story. If you are a fan of quality middle grade fiction, then you should read this book. You can find out more about the lovely Lisa Thompson here. Mortal Engines was published in 2001 and I would absolutely bestow the epithet 'classic' up on it. It's bloomin' awesome. Philip Reeve's imagination throws us forward to a time when cities have become moving human ecosystems which hunt and devour each other. The protagonist, Tom, lives in London and he thinks he understands the way things are, but getting to meet his hero and accidentally witnessing an assassination attempt hurls him out of London and turns him into a fugitive. His new perspective on the world raises lots of questions about what he's been told as a citizen of London. This is a gripping adventure in a beautifully drawn world. Once you open this book you won't want to put it down. The characters are wonderfully vivid and fascinating. The writing is skilled and stunningly visual. After reading this book I ordered a bunch of Reeve's other books, because I knew I would be happy to read anything he writes. Mortal Engines is the beginning of a series of books, so if you like the world Reeve creates there's more adventures to enjoy. Brightstorm is Vashti Hardy's middle-grade debut. It will be published by Scholastic in March 2018. It is the tale of the Brightstorm twins, Arthur and Maude, who find themselves orphaned and their family name smeared when their father doesn't return from his expedition to South Polaris. This is a terrific adventure that takes place on sky-ships, and is resplendent with sapient creatures, thought wolves, and a vindictive villain. The story has two protagonists and revolves around the relationship between the twins. They support and care for one another as they strive to clear their father's name, understand who they truly are, and build a new family amongst the explorer community. Young readers who loved Cogheart by Peter Bunzle and aren't yet ready for Philip Pullman's His Dark Materials will enjoy this story. I was so delighted that Tom Fletcher picked Beetle Boy to be a part of his bookclub, that I immediately set about getting my hands on his newest book The Creakers, and when it arrived I was impressed by what an attractive book it is. As soon as I opened the cover my four-year-old son, Seb, snuggled up next to me, attracted to Shane Devries' wonderful illustrations and he asked me to read it to him. The story is told in the voice of Tom Fletcher with all of his playfulness, joking and kindness. There are notes from the narrator at the end of each chapter and sometimes in the text, however, despite Tom's warning to the reader about the scary nature of this adventure my little one wanted to hear about Lucy and all the disappeared grown-ups. I have to admit to hiding the book for a week till he forgot about it because I read ahead and realised pretty quickly that this story is a little too scary for a four-year-old. However a six-year-old would love it, and it's a great book to read to kids, because the parent reader becomes the Tom Fletcher narrator, if you see what I mean. The Creakers is a cross between The Box Trolls and the BFG. It's quirky and funny, with great characters, and a story that races along and causes your heart to beat a little faster. If you have a child who is a fan of scary stories then this would be a good book for them. Listen to Tom talking about the inspiration for his book in the video below. Astrid the Unstoppable by Maria Parr is as perfect as snowfall at Christmas. It's classic storytelling at it's best, both delightful and moving. Astrid Glimmerdal is a gutsy young girl whose days are spent skiing and sledging down the mountains where she lives. Her best friend is a grumpy old man called Gunnvald, because there are no children in the village. One day she discovers he has a secret and everything begins to change. Weaving fairy tales and music into a modern story, set in a mountainous winter wonderland with the fierce and passionate Astrid at it's heart. This is a very special story, full of fire, yet thoughtful, it reminded me of Pippi Longstocking and Heidi. I loved it, particularly because of the way it depicts relationships between children and adults. Astrid the Unstoppable is Maria's second novel, and won the prestigious Brage Prize for best children's book and the Norwegian Critics' Prize. A Place Called Perfect by Helena Duggan has been one of the more visible debuts this year, what with its being Waterstones book of the month in August and then picked for the Tom Fletcher Bookclub. This, combined with the fact that the wonderful cover art is by Karl James Mountford (who does the internal illustrations for my books, and whom I adore), has caused the book to jump to the top of by TBR pile. Oh and they sent me cool glasses. Presents always help. I read the book in one sitting because the premise is curious and terrifying. As soon as you open the book you enter a town called Perfect, which has a strange problem, everyone there is blind and has to wear special glasses. Violet's father is an eye specialist and as soon as the family move to Perfect, their vision goes. Violet notices a series of strange things, and before you know it, you're halfway through the book, you heart is in your mouth and you're knee deep in adventure. I don't want to give anything away, so I will not share more. This is a well written book. It's a great read and operates on two levels, there's the surface adventure, which is thrilling, and then the discussion about the questionable nature of a society which vilifies imagination and requires conformity. Helena Duggan has produced a great debut and I suspect we've a lot more to read from her in the future. You can listen to Tom Fletcher reading an extract from A Place Called Perfect below. Most people who love books know that Katherine Rundell is an accomplished writer. Her prose is swift to read and littered with seeds which germinate in your imagination. Having just finished writing Battle of the Beetles, which is set in the Amazon rainforest, I was excited and slightly scared of reading her new book The Explorer. I was unable to afford the time or the money to go to the Amazon in person, so all of the research I did for my final beetle book was in libraries, online or in my study. I had read that Katherine actually went to the Amazon in preparation for writing this book, and I was so excited to see how she'd interpreted that experience in words. The Explorer doesn't disappoint. The story begins with a plane crash and four children being stranded in the Amazon. The lush greenery of the rainforest is evoked deftly and creates a lasting landscape in your head. Katherine loves to describe food in her books, and the food the Amazon provides is unusual and sometimes unpalatable, and these were my favourite bits. The hunger and the unusual meals are beautifully described. It's impossible not to love the baby sloth in the story, but I also really enjoyed the character of the explorer, he was complex, intriguing and a bit frightening in the best of ways. My favourite Rundell book is still The Wolf Wilder, but The Explorer is a great addition to her rich and varied list of children's stories. If you haven't read her books yet, then you need to.